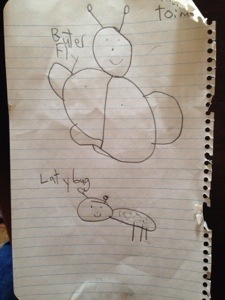 This entry was posted in Wordless Wednesday and tagged kids art, sibling love, wordless wednesday by jessica. Bookmark the permalink. That wonderful feeling when you make it to the party before the crowd… Thanks! soo cute…lovely ladybug indeed :D…cheers from Indonesia and happy Wednesday..
aw, how sweet is that. so cute.